Since my birth, I have had tremendous role models. One of them is my maternal grandfather, fondly called, Grandpa Sonny. 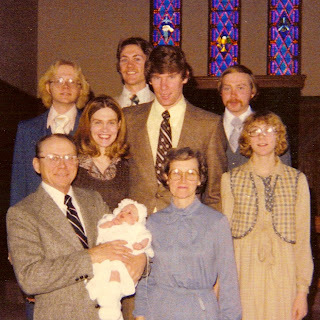 Grandpa Sonny holding me on my baptism along with my parents, grandma, aunt and uncles. 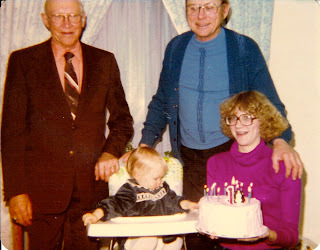 Each January in my childhood we celebrated family birthdays together. 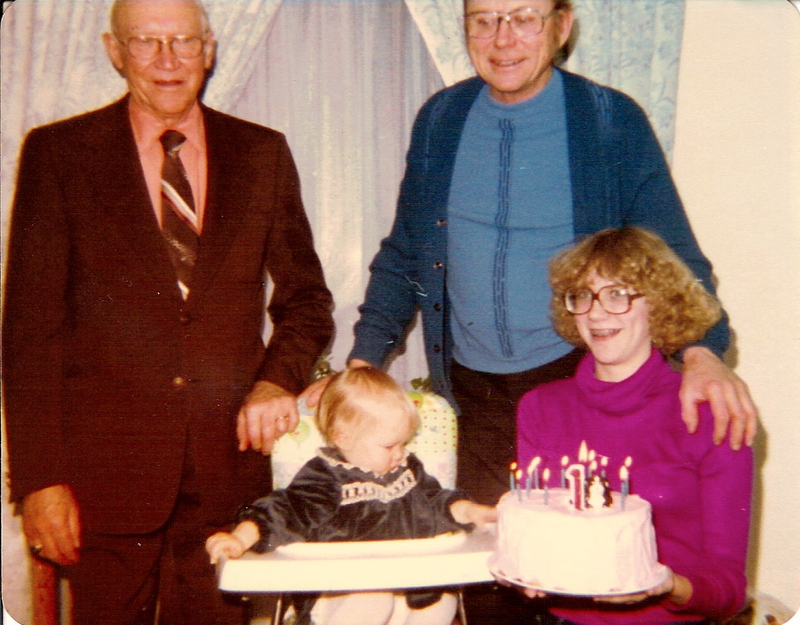 My birthday on the 6th, Great-Grandpa Odin’s on the 13th, Aunt Holly’s on the 16th and Grandpa Sonny’s on the 18th. Today is Grandpa Sonny’s 86th birthday. We are so blessed by the dedication he has to our entire family. This year, my grandparents will celebrate 60 years of marriage. He lives his life based in a deep Christian faith and loves life each and every day. Grandpa is a loyal fan and follower of all sports. He is most proud of attending sporting events of any of his children, grandchildren and now, great-grandchildren. I cannot count how many games I have attended with Grandpa. It started with my Aunt Holly’s basketball games in early 1980’s. Thirty years later, we are still attending games together, only now it’s his great-grandchildren’s games. Grandpa is a life-long farmer. He still actively works cattle alongside my uncle and farms with my parents and family. He lives in the house he was born in that his father built on the family farm. 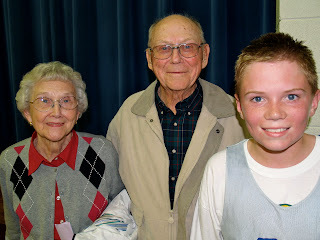 His only time away from the farm was to serve our country in World War II and to earn his college degree in agriculture at North Dakota State University. Grandpa is a friend. A few years ago, he accompanied me to the National Cattlemen’s Beef Association convention in San Antonio. I was so proud to have my cowboy and cattlemen grandpa by my side. Grandpa listens, shares his opinions and cares deeply about each his loved one’s success. He is one of the greatest men I will ever know, tied only with my father and husband. We are blessed and so grateful for all that Grandpa has given us. Happy Birthday Grandpa Sonny! We love you. Happy Birthday to your Grandpa Sonny! My parents will celebrate their 60th wedding anniversary in Sept. It’s amazing! I saw you post a comment on a couple of blogs I follow (one being Deb’s 3 Boys and a Bird Dog). Figured I’d come check you out. My husband has spent the greater part of the past 2 years in Fargo and Bismarck areas of N Dakota thru his emergency services work. so I’ve developed an affinity for folks in the northern prairie. I was raised in Wisconsin so still carry that northern farm blood in me, even tho I’ve been in Texas longer than I was in Wis.
WOW, you are SO BLESSED!! What a family, what a grandpa! I come from a “broken” home, so seeing such a family as this blows my mind. Happy Birthday Grandpa Sonny….looks like you are very loved….Congratulations on 60 years of marriage…that is just awesome…. You are so truly fortunate to have a loving family like this. Happy Birthday to Grandpa Sonny, and wishing him many, many more. Fondly wishing you a very happy birthday and wonderful year ahead, from Patrice Gigler Scott.